Easy transit access to Dolores Park from the J-Metro which connects to BART at Ocean from the South and at any Market St. BART Station. The Bay Area's # 1 Latin site with news and cultural coverage as well as a strong entertainment section. Cinco de Mayo celebrates solidarity among Mexican and Latino immigrants to the USA. It's date which usually means a parade on the first weekend in May for Latin communities throughout USA. The date itself refers to one of Mexico's four major invasions through the Carnaval City of Veracruz. However Veracruz is also the cradle of all the great civilization of middle America, learn more about the mysterious first invadors, the Olmecs. The French attackers were defeated further inland at the Battle of Puebla on May 5, 1862. San Francisco, until unprecedented global events of 1849 which created the world most multicultural City, was Mexico's most Northern City and perhaps its still is. San Jose: First Sunday in May Parade 9:00 am - 12 noon in downtown San Jose from Santa Clara Street from Autumn to South Market Street. Followed by a food-and-music-filled festival from 10 a.m. to 6 p.m. at Guadalupe River Park, San Carlos Street and Woz Way, and in nearby streets. $1, free for kids younger than 12. 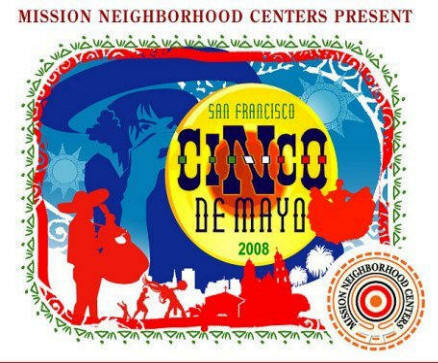 Where: Parque de los Niños, 23rd St. & Folsom St. & Treat Ave., San Francisco. If you love Menudo, you'll love being in San Marcos, Texas the first weekend in May for their big statewide cook-off. Burrito The capital of the North American Burrito is San Francisco's Mission Dristrict. World's 2nd Largest Burrito (pictorial). 12 recipes to brighten a sprightly holiday meal, whether enjoyed at home or at a picnic in the park following a colorful parade. "From its color to its most renown flavor it reminds us of a Mexican texture that harmonizes tradition and myth. Tequila owes its essence to a deep root blended through time"
" Mexico is largely a lager nation...beers tend to be smoother, cleaner and more subtle than ales." Carlos' message for the new millennium of international brotherhood tells us to keep playing and praying. We think salsa is one of the big four Musical S's of New World Carnaval music. The others are being samba, soca & swamp. To change your left frame menu to our all Latin menu featuring Salsa and Veracruz Carnival click here. (Hint: the left margin will collapses if you drag it to the left. Folklorico.com Instituto Cultural "Raices Mexicanas"
Schedules, recordings, Lectures and Workshops. The Battle which made Benito Juarez the father of the nation. The French had landed in Mexico on the pretext of collecting Mexican debts from the newly elected government of democratic President (and Indian) Benito Juarez. The other debtors, the English and Spanish, realizing the French had ambitions of conquest, quickly made deals and left. TRIVIA QUESTION: Carlos Santana is only the second most popular Latin guitar player to spend formative youth years growing up in the SFMission district. Who is the first ? "Santana on the crest of a wave, culling the cream of the music world's singers and incorporating catchy rhythms and of course mind-blowing guitar-playing from Carlos himself. Nearly all the songs here are perfect"
1 of nearly 1000 reviews ! Open Directory Project should become more frequent stop as paid listings continue to erode search engine results for the users. Bay Area's leading bilingual weekly founded in 1987 published by Jose del Castillo. Spanish bilingual monthly associated with SF City College. Founded: 1970. Circulation: 10,000. Publisher: Juan Gonzales. "Largest" Bilingual Spanish weekly distributed in Northern California. Founded: 1980. Publisher: Hilbert Morales. Carnaval.com features Nine Global Cities including the birthplace of Salsa the one & only NYC. Also the home of Spanish speaking America's largest Carnaval and site of middle America's most important events is Veracruz Mexico As we approach the 40 year anniversary of Castro's Cuba and the death of most associated with one of America's most embarrassing international dialogues we can start appreciating the amazing musical culture of the Caribbean's largest nation. Here is our DRAFT guide to Cuba, which awaits an excursion or an editor before we completely launch it. "With feet on both sides of the border we declare that Cappuccino and poetry are no more! 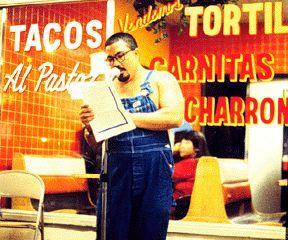 Long live salsa and the spoken word! May is time for ethnic celebration. Cinco De Mayo is just one day. But the whole month is Asian Pacific American Heritage Month. Get out the egg rolls, and let's party! But if the prevailing attitude of Ward Connerly's Classification of Race, Ethnicity & National Origin Initiative takes over in California, they won't be happening for long. For Educators California has established an official state holiday to honor Latino labor leader Cesar Chavez. Cesar Chavez Day is intended to promote service to the community in honor of Chavez's life and work. This day will be celebrated on March 31st, in honor of Chavez's birthday, or the appropriate Monday or Friday nearest that date. "Our separate struggles are really one -- a struggle for freedom, for dignity and for humanity...We are together in spirit and in determination that our dreams for a better tomorrow will be realized." May 4, 2002 President Bush renewed his support for border reforms to speed commerce and visitors between Mexico and the United States while keeping out terrorists and drug traffickers. He urged Congress to extend immigration measures allowing Mexican families to stay together while awaiting permanent residency in the United States. Cowboy Summit is President Bush's first trip abroad || Bush, Fox talk trade, immigration. Search sfgate for "Vicente Fox"
Skilled translators needed: Become a part of Global Exchange's efforts to promote human rights and democracy in Mexico even if you don't live in San Francisco and can't spend months abroad!